The Tradition is a spa that you'll instantly fall in love with. 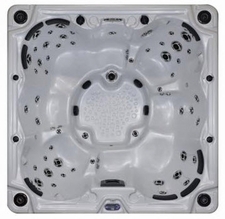 Roomy and luxurious, the Tradition provides you with all of the great features of today's spas for a truly great price. Relax in the best Viking has to offer ... you deserve it! 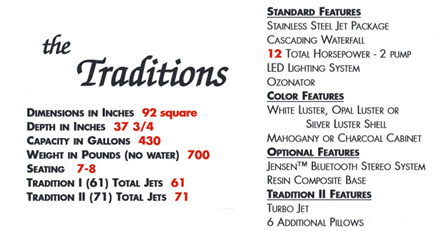 The Tradition features 61 total jets. Our engineers spared no expense in putting in this spa all of the designed comfort and luxury they could think of. Take for example, a lounger with 18 jets complete with hand and foot massage. This 2 pump goliath also features a diverter jet that activates all of the floor jetting to get the ultimate foot massage. The shimmering jet in the floor in the picture of our Tradition is our Volcano jet. This name definitely is accurate for what you will see when you turn it on. 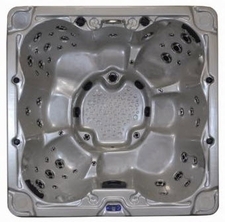 Complete with our patented indirect LED lighting, LED cup holders, cascading waterfall and Jensen stereo option ... this spa is the ultimate for anyone desiring our best.